Visitors to Brocklands are welcome during normal opening hours (in other words during daylight hours) and you don't have to contact us prior to visiting. There is a network of woodchip paths around the site so wellingtons are not needed, just a pair of sensible shoes. These paths can reasonably accommodate wheelchairs with large wheels - we have had difficulties with the small wheel type. Visitors to recent graves can easily find them if they know the plot number, so make sure you have it written down before you come! The number is always situated at the foot of the grave plot. Once trees and plants have become established, visitors are not encouraged to seek out individual graves especially during summer, as this could have a negative impact on the plants etc. Over time plots become a part of a larger whole, i.e. the woodland. There is a small section of the site next to the burial area, which is intended for quiet contemplation. There is a traditional bench here with a holly and sweet briar hedge around it giving a secluded atmosphere, where you may sit and enjoy the view. 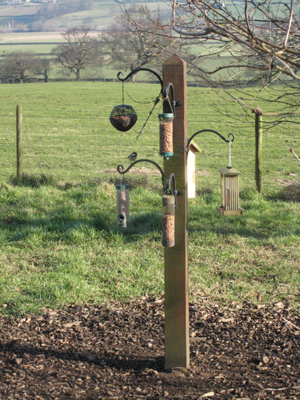 There are special birdfeeding posts on the site, and families may bring their own feeder, or fill others with nuts and seeds when they visit. This may be done instead of leaving graveside flowers, as a gesture of remembrance, and is particularly good for children and grandchildren. Families are welcome to bring dogs to the funeral if they wish. At all other times, however, in order to avoid the problem of dog-fouling, visitors are requested to keep dogs in their cars, with the window ajar, or tie them to the post provided at the entrance. The rough ground alongside the entrance track may be used to exercise your dog. Please dispose of any dog mess.